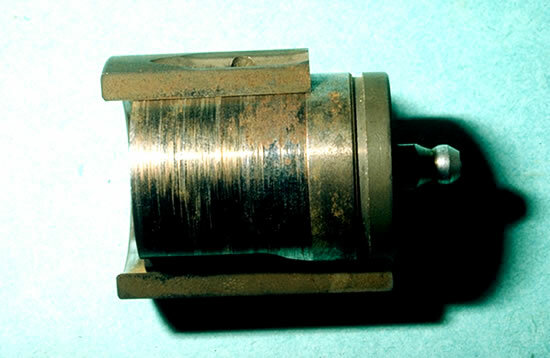 Friction-wear at an axle-cylinder contact point. Fretting-corrosion is a combined damage mechanism involving corrosion at points where two moving metal surfaces make rubbing contact. It occurs essentially when the interface is subjected to vibrations (repeated relative movement of the two contacting surfaces) and to compressive loads. The amplitude of the relative movement is very small, typically of the order of a few microns. When the frictional movement in a corrosive medium is continuous, the resulting process is termed tribocorrosion. lubrication with oils or greases, to reduce friction and exclude oxygen from the interface. Increase in the hardness of one or both materials in contact. Certains material combinations show better friction behaviour than others. Surface hardening treatments can be beneficial. Use of seals to absorb vibrations and exclude oxygen and/or moisture. Reduction of the friction loads in certain cases, or on the contrary, increase of the friction loads to attenuate vibrations. Modification of the amplitude of the relative movement between the two contacting surfaces.